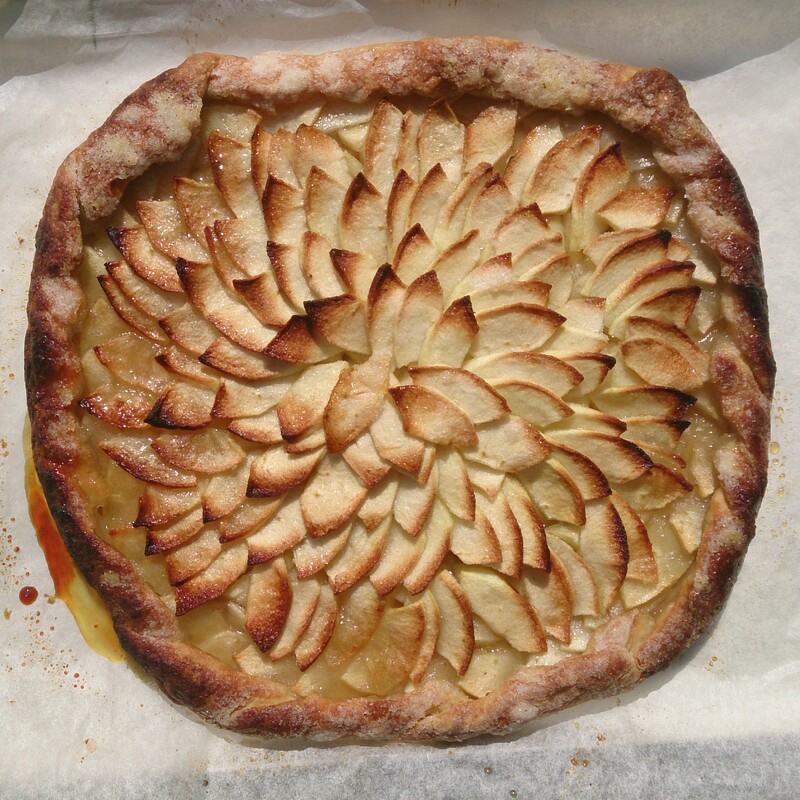 bettymadethis – Baking and making…its what I do best! Baking and making…its what I do best! Things certainly have changed since I last wrote on here. Teacher training started & finished in the space of a few months (definitely not for me), moved accommodation three times, worked at various places both good & bad & been through a whole load of personal issues. This last year has seen many improvements: a job I enjoy, new relationships, a lovely flat & a little cat. All these have started to make me more confident in myself & my making, inspiring me to get the needles & hooks back out. A renewed yarn problem has begun, filling up the cupboard spaces, shelves & bags dotted around the flat. Above are a few photos from recent projects involving patterns created myself & a couple from followed patterns. There is a knitted jumper, crochet bags, phone cosies & a stash buster cat blanket. This is such a simple little recipe but strikes a real love from those who eat it (especially me!). It didn’t last long at my parents house at all! The lengthy bit is the cooking, but you don’t need to worry about it whilst its in the oven. Other than that, if you can slice some apples, make pastry & boil some fruit then you can make this tasty little number. I highly recommend that you give it a go. 4-5 apples depending on their size. Eaters are best. PASTRY…In a large bowl or food processor rub the butter into the flour & salt. Rough breadcrumbs, but not too fine, some buttery lumps will make the pastry even more flaky. Slowly add the cold water, a little at a time until the mixture comes together. Wrap in clingfilm & pop in the fridge for about half an hour. FILLING…(take the pastry out of the fridge whilst you prepare the apples). Peel & core the apples, popping these into a saucepan. Slice the apples into 2-3mm slices, pop the nice larger slices to one side & the smaller ends into a bowl. Roll out the pastry till a large circle about 2-3mm thick. Transfer to a piece of baking parchment on a baking tray. Spread the smaller chopped ends of apple over the middle of the pastry, leaving a 4cm edge. Neatly, & in any way you wish, arrange the sliced apple over the chopped apple. Roll the edges of the pastry up & slightly over the outer pieces of apple. Brush the pastry with the melted butter & sprinkle the caster sugar over the apple & buttered pastry. Pop in a pre-heated oven. THE GLAZE…just before you take the tart out of the oven, pour the apple juice/cider into the saucepan with the peels & cores. Add the sugar & slowly dissolve the sugar over a low-medium heat. Pass the liquid through a sieve into another saucepan & add the cornflour mixed with a little cold water. Heat until it thickens. Once the tart is out of the oven & still hot brush, or pour this glaze over the apples. Recently I had some lemon meringue pie, I had forgotten how amazing it is, so much so that it didn’t seem to last very long. Once home I told a friend of my forgotten love of this pie, to which they responded how much they too liked it but hadn’t eaten it for a while. So this here pie is being taken round to my friends house once cooked for us to enjoy together whilst sat in the sunshine. PASTRY…Firstly make the pastry as this requires at least 30 minutes in the fridge to chill. Cream together the butter & sugar till soft & smooth. Slowly add the egg & yolk mixing all the time. Mix in the flour till it forms a dough, wrap in clingfilm & pop in the fridge to chill. When chilled roll the pastry out on a floured surface to a thickness of about 3-5mm & large enough for your tart tin. Line the tart tin – a good way of doing this is to gently & loosely roll the pastry around your rolling pin, then drape it over the tin, easing it into the corners. Trim the edges with a nice sharp knife then blind bake the pastry for 15 minutes at 190c. FILLING…In a saucepan put the egg yolks, 100g caster sugar, lemon juice & rind & the boiling water. Mix well. Mix the cornflour with a little water & add to the lemon mix on a medium heat. Keep stirring. This will start to thicken to a jelly/jam like consistency. Pour into the baked pastry & level out. 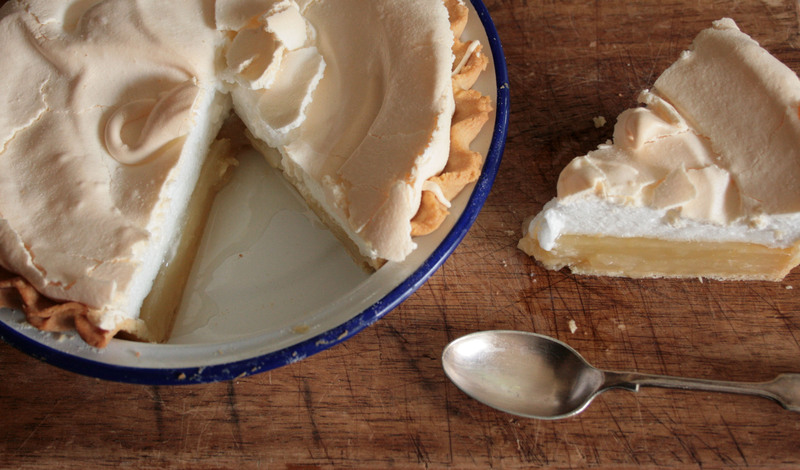 For the meringue topping, whisk the egg whites in a clean, grease free bowl till they form soft, stiff peaks. Slowly add the 100g caster sugar whilst whisking. Once mixed dollop onto the lemon filling in any way you wish. Cook at 150c for 25 minutes till lightly golden. Malt loaf is a sticky, chewy, sweet bread, best served with proper salted butter spread thickly & accompanied by a steaming cup of tea. Malt extract is a sticky, treacle like gloop, originally a by-product from the brewing industry. 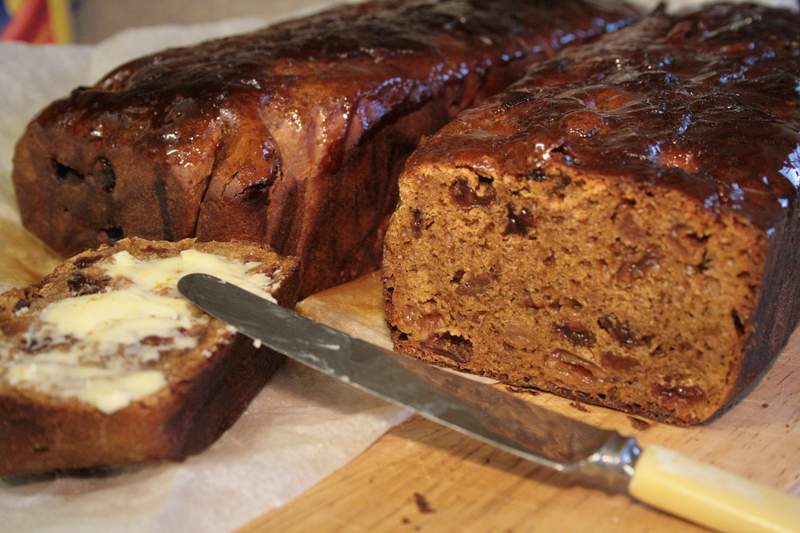 This is a traditional style recipe using sultanas, but feel free to experiment with your dried fruit (my next one will more than likely contain cranberries). It is a popular food for cyclists to eat whilst on the bike, yes it becomes a squashed lump in your jersey pocket by it doesn’t fall apart & remains delicious. I tested the theory on if it was cycling rocket fuel recently, I cant say it is magic but it certainly helped keep me going for 75 mile! Grease & line your tins. Sieve the flours together in a large bowl (if you have a food mixer use it as the dough is very sticky), add the salt & yeast. In a saucepan place the sultanas & orange juice, heat gently so that the sultanas plump up (you don’t need to do this but I prefer the end result). Leave to cool. In another saucepan melt the butter, malt extract & treacle together over a gentle heat till the butter is just melted. Add the water & mix. This should now be a nice warm temperature. Add the sultanas & treacly water mix to the flour. Mix together till it comes together as a soft, sticky dough. Divide this between the two tins & level out. Either place in a plastic bag or cover with clingfilm & leave somewhere warm to rise. It should double in size & can take anywhere from 2 hours to 6 hours. Once risen, remove from the bags & place in the pre-heated oven for 40 minutes. To check that they are cooked, remove from the tin & tap on the base, it should sound hollow. Whilst they are still hot brush with the honey or syrup, this will create that delicious sticky top that you associate with malt loaf. Enjoy! This recipe for Courting cake was given to me by a Northern relative. 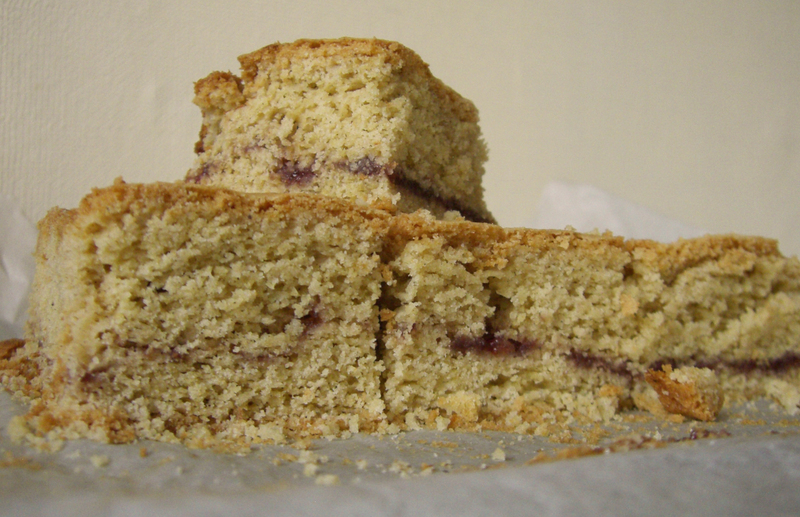 It is similar to a Victoria sponge, only more dense with a greater ratio of flour to butter & eggs. Traditionally the cake was baked by the lady that was being courted for her betrothed. A sign of her love & a hopeful proposal. It’s a lovely story, but even better is the cake itself. I have eaten so much of this whilst visiting my relative whilst supping copious amounts of tea. A real treat for all the family & great for picnics outdoors (wishful thinking on the weather part) or indoors. Jam or fresh strawberries slightly past their best. In a large bowl, rub together the butter, sugar & flour till it resembles breadcrumbs. With a fork mix in the eggs till combined. Divide the mix into two. Roll out one half of the mix, or if easier squash into the baking tin with the back of a spoon. Spread jam, or strawberries over this. Roll out, or squash in the other half of the mix on top of the jam/strawberries. Brush over a little milk & then sprinkle over the sugar. Careful not to overdo this as it could burn. Once cooled cut into squares & enjoy! Baking tray, greased & lined. CRUMPETS! how delicious, perfect for any time of the day, with cheese, honey, jam, scrambled eggs…any way you want them. 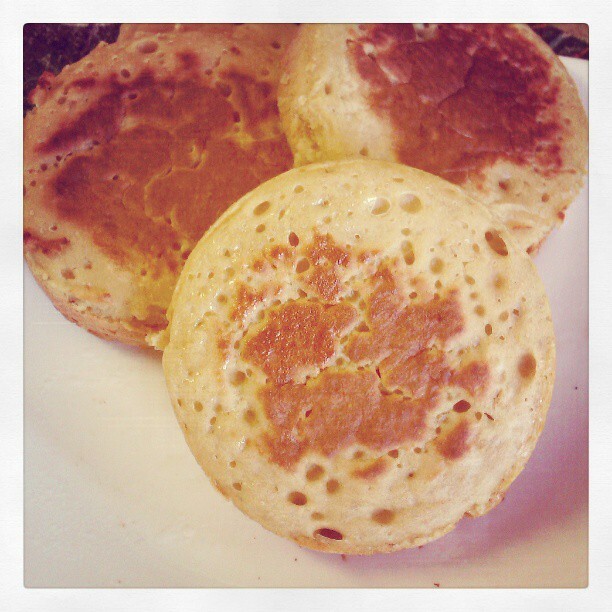 I have attempted to make crumpets before but failed miserably, still to this day I am unsure why. So I decided that I would have another bash. Reading up on recipes I discovered that yeast & bicarbonate of soda produced the best results so that was what I went with here. Along with some patience & a slow cooking process (I only own one cooking ring) the crumpets were lovely & I will be making them again. 1. In a large bowl mix the flours, salt & sugar together. Then add the dried yeast. 2. Mix the milk & water (this will be warm so it can activate the yeast) together then pour into the flour. Mix well. 3. Cover & leave for about two hours until it is nice & bubbly. 4. Mix the bicarbonate of soda with a little warm water then stir into the bubbly mix. This will bubble even more & fizz. Cover & leave for another half hour. It will then be satisfyingly bubbly – which will make your crumpets bubbly. 5. Heat a thick frying pan or flat griddle to a low-medium heat, grease a cooking ring (or as many will fit in your pan if you are lucky enough to have more than one) & place in the pan. Spoon a ladle full of mix into the ring. 6. Leave it alone until the top starts to look dry & hole-y. Then flip it over & carefully remove the cooking ring, cook only for a couple of minutes. 7. You can now eat your hot crumpet! As this makes a few I am going to freeze some for a later date, defrost & toast like a shop bought crumpet…I’m sure that will work just fine! PIE IN A CUP! This is possibly one of the best things in the world! Especially when it contains chorizo & beer…Personally I don’t like too much pastry, it is the tasty, succulent filling that I’m after! Here I have gone for a classic beef & ale. 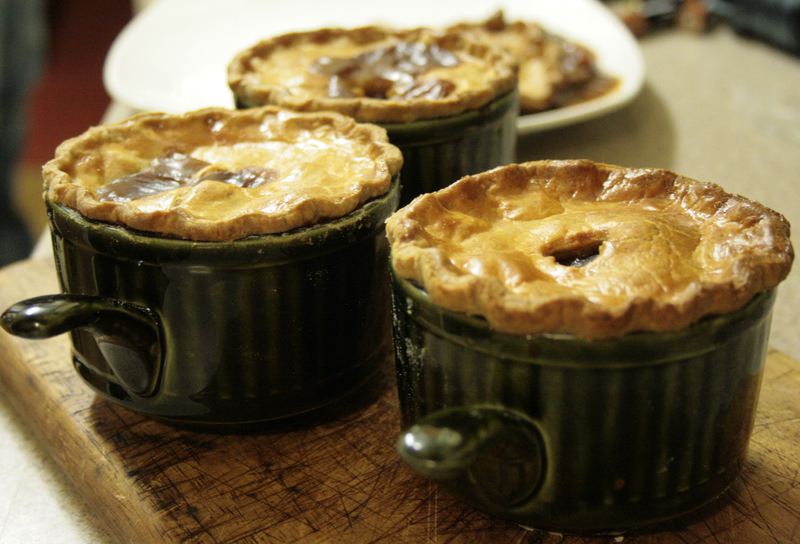 I first made these ‘pie in a cup’s for a buffet for family over christmas where they went down a storm. Ideal for freezing to cook later if you cant eat them all at once. TO MAKE THE PASTRY…rub the butter into the flour, salt, thyme & parmesan till it looks like breadcrumbs, then add just enough water until it forms a dough. Wrap in clingfilm & place in the fridge. TO MAKE THE FILLING…Gently fry the chorizo in a large frying pan until the oils come out, then add the onions, fry till softened. Add the garlic & cook for a further 3-4 minutes. Then transfer into a large casserole dish. In the casserole dish add the chopped mushrooms, carrots, bay leaf & thyme. In the same frying pan that had the chorizo & onions brown the beef. You may have to do this in a few batches depending on the size of your pan. Once browned add to the casserole dish. Now deglaze the pan with half the ale, bring to the boil & scrape the tasty bits off the bottom with a wooden spoon, then add to the casserole dish along with the rest of the ale, stock & tomato puree. Pop into the oven at 200c/gas5 for 1½-2 hours till the beef is tender. Take the dish out of the oven, stir in the cornflour & return to the oven for 5 minutes to thicken. Take out & leave the filling to cool. Once cool, fill your cups to within 1cm of the top. Roll out the chilled pastry & cut a lid slightly larger than the diameter of the cup, cut a hole in the middle to allow steam to escape. Brush egg round the rim of the cup, place over the lid, crimp & brush with egg wash.
Place in the oven for 20 minutes until the filling is hot & the pastry crisp.